Read Dave Stewart’s full review from the February 2017 issue. Read Keith Gemmell’s full review from the June 2016 issue. See the full review from the July 2016 issue. “For many bedroom producers and small studio set-ups, being able to obtain a truly great orchestral sound has always come at a price – spending serious money on orchestral samples that eat into valuable disk space being a main issue. Reviewed May 9th 2016. Read the entire article. Reviewed by D Smolken on April 4, 2016. See the full post. 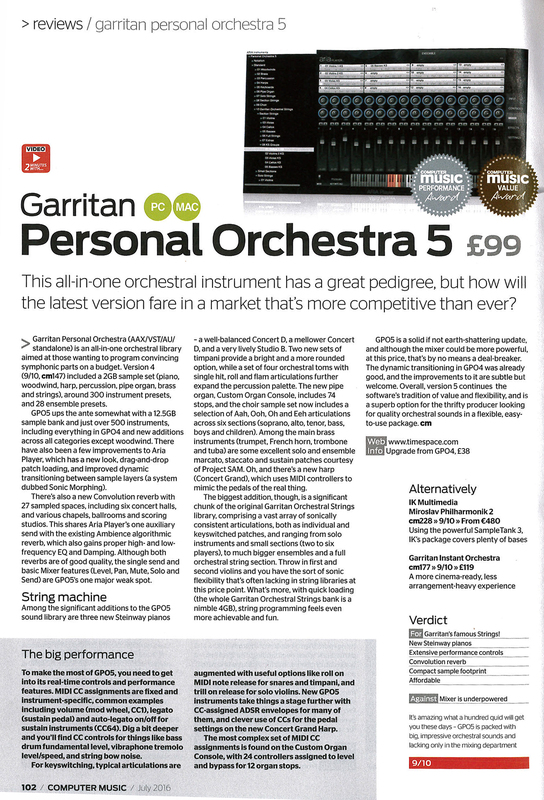 Todd Urban of Urban Sound Studio leads a virtual tour/review of the new features of Garritan Personal Orchestra 5. He demonstrates how to use multi-timbral mode, load instruments with the new browsers, and demonstrates some of the new sounds, patch navigator, and key switches. Screentalk is one of the world’s leading and renowned screenwriting magazine. Keyboard Player is the longest running keyboard magazine in the U.K. This is perhaps the Longest Sample Library Review ever written. Cakewalk.net is one of the leading resources for Cakewalk users. Tape Op is a leading magazine in the professional recording community. “Having a great-sounding virtual orchestra automatically realize a computer notation score is the dream of ant computer-based composer or arranger…We’ve taken the popular Garritan Personal Orchestra (GPO) and paired it with notation applications Sibelius and Finale, an ideal setup for producing slick demos from your chamber music or full orchestral scores.” The author writes about ensemble building “Assemble Your Ensemble”, then there’s a section on “Know Your Controllers” which discusses the various MIDI controls used in GPO. There’s a section on “Configuring Your Software” which shows how to set up GPO with notation software and how to record it to audio using GPO Studio. In a comparison between GPO and a library costing four times as much, GPO fared very favorably. Music4Games is one of the leading resources for music in the gaming industry.